The IDEAL IMPLANT is a new, innovative breast implant option that offers the benefits, without the drawbacks, of both traditional saline and silicone gel implants. Dr. Benjamin Gelfant is a board-certified plastic surgeon in Vancouver, BC, who is part of an exclusive group of surgeons eligible to offer the IDEAL IMPLANT® Structured Breast Implant to their patients. During a recent interview, Dr. Gelfant discussed how he helps women decide between these three breast implant options. Describe your work experience as a plastic surgeon. “I started in practice in 1989, shortly before the moratorium on silicone gel implants came into place in April of 1992. I had a brief experience with polyurethane foam covered textured implants in 1990-91. From 1992 until 2006, with very limited exceptions, my practice was exclusively saline filled breast implants and I was one of the first to use transaxillary endoscopic approach to breast augmentation, which became a very big part of my practice success. When silicone gel implants came back onto the market, it was clear that, except with using small implants, transaxillary augmentation was not going to be a viable approach, so I went back to using inframammary incisions for the next few years until the advent of the Keller Funnel. 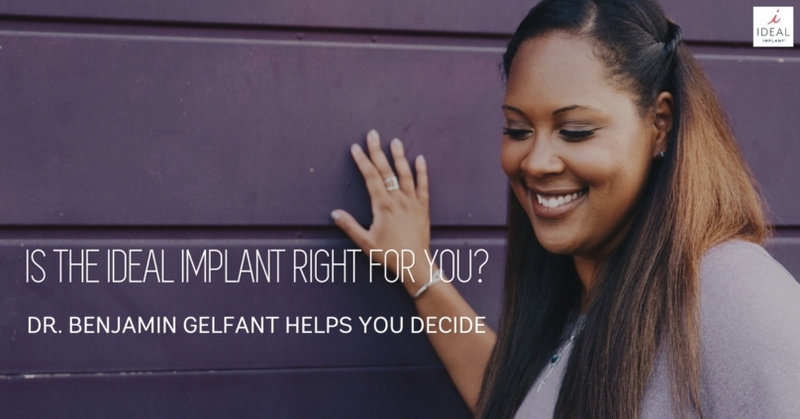 How do you help your patients choose between the different types of breast implants? How have your patients responded to the IDEAL IMPLANT? For your patients that choose silicone gel breast implants, what are their main reasons? “Patients are subject to peer influence and say, ‘My girlfriend got these.’ So, there are a significant number of patients that want what their girlfriends have. They come in asking for ‘gummy bear’ implants and they’re confused about that. They think that silicone gel is ‘gummy bear’ and the Gans Marketing term of cohesive gel. Well, they’re all gels. It all comes from the same company in California and is sold to different implant companies. How do you help reduce the rate of capsular contracture among your patients? Considering breast implants in Vancouver? Contact Dr. Benjamin Gelfant today to discuss your options. Simply call 604-874-2078 or visit www.drgelfant.com. Dr. Gelfant’s office is located at 1333 West Broadway #100, Vancouver, BC, V6H 4C1 Canada. Call today for more information on IDEAL IMPLANT® Structured Breast Implants.